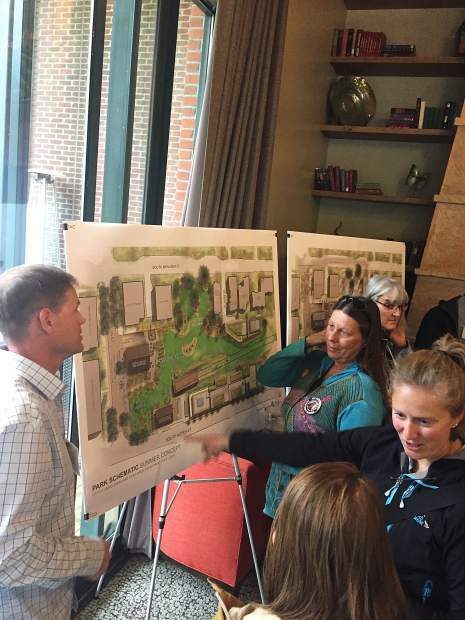 Kevin Dunnett, planning, design and construction manager for the city of Aspen’s parks department, explains to a group of people the plans for a ski corridor at the base of Aspen Mountain during an open house held at the Limelight Hotel on Monday. Developers hoping to inject vitality into the base of Aspen Mountain’s west side with a new chairlift coming down to Dean Street ­— accompanied by two new lodging properties, three parks, a museum and a restaurant — shared their vision Monday with about 300 residents who attended an open house. Representatives from the proposed Gorsuch Haus and Lift One Lodge explained to the standing-room-only crowd at the Limelight Hotel that they’ve been working hard for the past year to bring forward a development that the community wants. 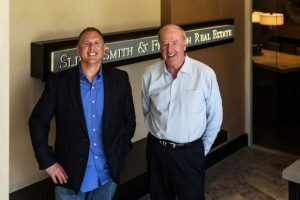 “This will truly be a second portal to the mountain,” said Michael Brown, who along with his brother, Aaron, are the developers behind Lift One Lodge. Brown added that they reconfigured their already-approved project to accommodate the chairlift coming closer to town. The current Lift 1A is anticipated to be replaced with a “telemix” — a combination of a chairlift and gondola that would go up to Ruthie’s Restaurant in four minutes. Aspen Skiing Co. would pay for part of it, and so would the developers of Gorsuch Haus, who are proposing an 81-room, 64,000-square-foot hotel along South Aspen Street. Jeff Gorsuch told the crowd that the plan brings the town to the mountain and is a “historic opportunity” to honor the origins of skiing by preserving the original Lift One, built in the 1940s. The Browns, who own the Skiers Chalet and Skiers Steakhouse buildings, plan to re-fashion them to accommodate a ski museum and guest services, as well as a bar and restaurant. The plan also calls for 50 public parking spaces below the lodge, ski lockers and three parks. Both developments will mitigate for affordable housing off site, either through buying credits or a built project. If approved by voters, Brown said it would take four or five years for all of it to be built. Lift 1A would be out of service for one or two seasons. Because it involves city land, zoning changes and variances to the land-use code, the plan requires a public vote, which is anticipated for this spring. Gorsuch asked the room for its support in that election and said the project connects the heart of the mountain with the soul of the town.